Access All Areas members have a brilliant pack of ready-made logo designs, vector elements, textures and poster graphics to download today, courtesy of Evgen Radchenko from JeksonGraphics. Use these elements to create your own designs with a summer/surfing theme, such as t-shirts, stickers, promotional material and more. Each logo and poster template can be customised by editing the text, or you can use the individual graphics to quickly produce custom artwork. All assets come in a variety of formats, including AI, EPS, SVG, PSD, JPG and PNG for maximum compatibility. 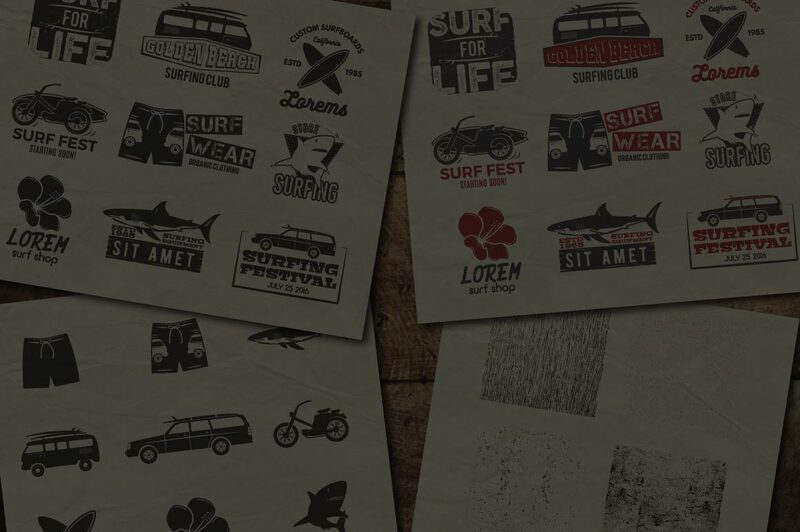 The Vintage Surfing Graphics Pack contains a range of resources, including 9 premade surfing badges, surfer themed graphics, 4 vector textures and 4 retro poster designs. Also included is a help file containing links to a range of freely downloadable fonts used within the artwork so the designs can be customised while retaining the original appearance. Ow! This is really premium content, thanks for sharing. Perfectly timed. Dude you are helping no end. Glad you’re liking the pack Steve!